Includes Electronics For Disabling The Suspension Warning Light. 2000-2005 Cadillac Deville Deluxe Rear Air Suspension Conversion Kit With Resistor (CADR12) is the perfect solution to your air suspension problems. Designed to be very affordable, you can convert your air suspension to use standard. The original air suspension system on the 2000-2005 Cadillac Deville relies on each component functioning in sync at all times. This reliance is expensive and inefficient. Strutmasters' air to non-air suspension conversion kit is a direct replacement solution that gets rid of this dependency for good. Made in the USA, the kit comes complete with two rear shocks, two rear Eibach springs, and all necessary hardware. Customers appreciate that the kit is installed on the Deville in about one hour per wheel. Detailed instructions and online installation videos provide easy-to-follow directions. If further help is needed, ASE certified experts offer technical support over the phone. The kit costs a fraction of the prices of alternative solutions, without sacrificing quality. A closer comparison between this coilover suspension conversion kit, dealership direct replacement, and individual aftermarket part replacement will highlight the considerable savings. 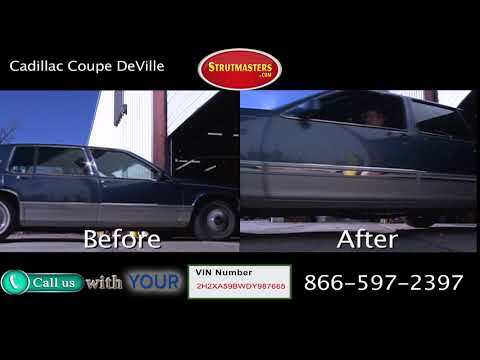 How Do I know If My 00-05 Cadillac Deville Air Suspension is failing? 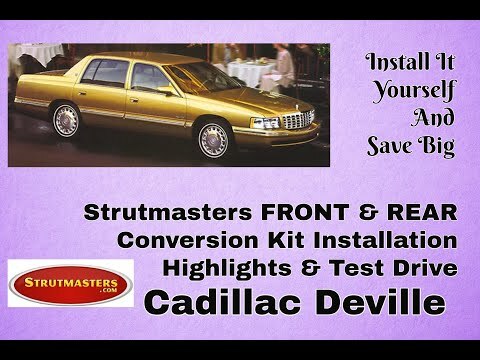 Look for the classic signs of a failed or leaking air suspension system in the 2000-2005 Cadillac Deville before it's too late and total failure sets in. An inability of the Deville to maintain the proper ride height points to a bad suspension. 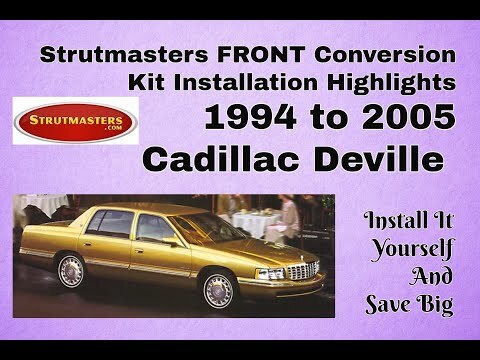 One of the most noticeable symptoms is a sudden ride height variance between different sides of the Deville. Typically the rear end will sag while the front end will remain inflated. This gives the illusion the Deville is squatting down in the rear. There might also be a shifting lean from one side to the other. These imbalances wear out the air compressor if they are not fixed in a timely fashion. If the air compressor runs too often or stops working altogether, suspension failure will advance. At this stage, a suspension warning light illuminates on the instrument cluster. 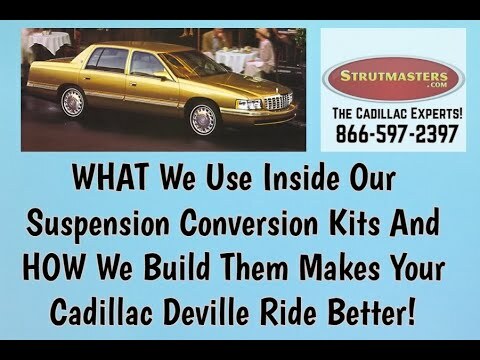 2000-2005 Cadillac Deville Shock Absorbers (x2)- a metal tubing filled with gas-charged hydraulic fluid that is connected to the wheel of a vehicle in order to reduce the effects of vertical travel on a rough surface which controls the bounciness, and therefore comfort, of a vehicle. 2000-2005 Cadillac Deville Height Sensors (x2)- a linkage located near each wheel of a vehicle with any electronic suspension that, either mechanically or electronically, constantly measures the height of the vehicle, and reports this information back to the control module so that the computer can identify if changes in height need to be adjusted accordingly. The ride height sensor is a moving part, and like all moving parts, they will eventually wear out. 2000-2005 Cadillac Deville Suspension Control Module- a computer which is responsible for the operations of the air suspension system and maintaining the vehicle√¢¬Ä¬ôs correct ride height. “Last year replaced rear air-ride shocks to the tune of $1000.00 plus. Noticed front struts were emitting some noises and not handling little bumps so smooth. Car had 32000 miles at purchase – appears car sat around. Approached my shop about an install on the front struts – mechanic advised to replace both front struts and rear shocks again as there was several 1000 miles since I did rears. Cost $2100.00. Ready to trade it in. Found out about conversion kits from SM. Not rushed on the phone – tech very helpful/personable. Bottom line – better ride than OEM – handles better. Even with install labor price – still saved $1000.00. Make sure mechanic pulls correct relay/fuse for leveling system/computer. Lost radio once I picked up car. Mechanic pulled wrong relay by accident as they are side by side. Car is straight – height where it should be. After installing new shocks and springs on the rear of my ’05 Deville it rides and drives like it should. Much cheaper than replacing the compressor and air shocks that were original equipment. I’m very pleased.